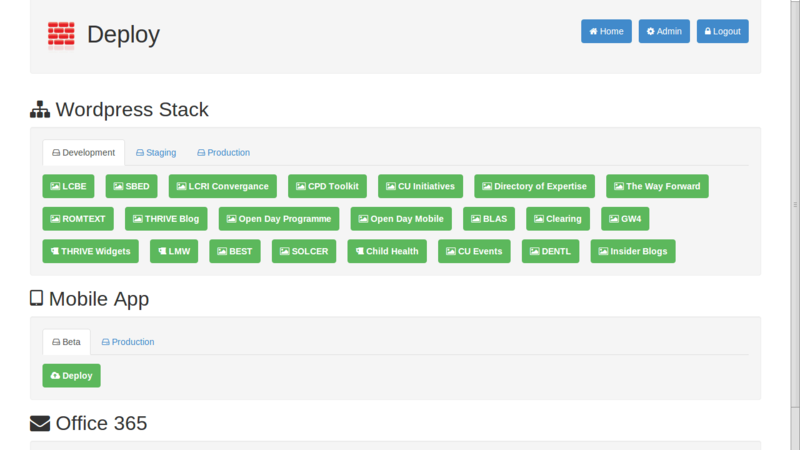 While working at Cardiff University during my year in industry I was given a task to improve the deploy tool which originally export sites from SVN and then deploys them onto different servers. I was asked to add a new admin interface, add a database and make the script more efficient. I created the admin interface primarily using Bootstrap, PHP, Slim framework and HTML Twigs. The admin interface allows the administrator to add, edit and delete users, modules (sites), environments (versions e.g. development or live) and stacks (platforms e.g. WordPress). In the old version all of the scripts were stored in array which meant it was very messy and time consuming to add new scripts. I created a new database with a form which made it much easier for users to add scripts to the database. I made the scripts more efficient by using an SVN update so it would only change files on the server if they had been edited.